File photo of prostate screening on Nevis earlier this year. Almost two months after the annual free prostate screen, the results suggest a slight decrease in abnormal findings. 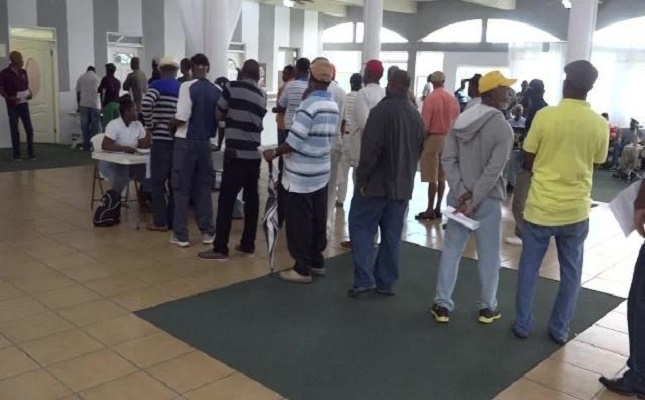 The annual prostate screening was held on January 12 at the Occasion Hall on the by-pass road. The annual free prostate screen is an initiative launched by Miami urologist Dr Dwayne Thwaites. Thwaites volunteers to examine any man 40 and older or men that have close family that have died from the disease. This year, 650 men were examined. Junior Minister of Health, Hon Hazel Brandy-Williams said during the screening that over the years they have seen more and more men attending the screenings as well as younger men are now attending. She said that this indicates that men are aware of their responsibility of remaining healthy and so they want to know what their status is. The first years results showed a detection rate was at 8%. In the 2017 screening, there was an abnormality rate of 14.53 percent, an increase over the 14.47 percent the previous year. This year’s results showed that of the 650 men screened there were 86 abnormal findings, a rate of about 13.23 percent. The Observer made attempts to contact Nurse Jessica Scarborough for comment about the results but all attempts were unsuccessful.